1912 A field around the St Augustine’s area had been taken over by the London Diocesan Mission. In October, boundaries were defined and a site for a church decided. Father George Day, Missioner-in-Charge. 1913 The first church was built. It was a wooden building, surrounded by fields and farms, dedicated by the Bishop of Willesden at Candlemass, February 2nd. In historical terms St Augustine’s, at 100 years old, is a new church, but in local terms it is fairly old. St John’s Church in Wembley High Road is older, built in 1846. By 1912 it was thought that a church closer than St John’s or St Mary’s, Harrow-on-the-Hill, would be easier for local people to reach on foot. 1918 – 1925 After the 1914-1918 war it was felt that a larger and more permanent church should be built. Progress was slow following the war years. The Wembley Park area remained a rural backwater, visited only by day-trippers out for a picnic and a breath of country air. Wembley became, overnight, the centre of the nation’s attention. The Empire Exhibition had arrived with all the publicity and media news in tow. Industry and new housing projects were started. Funds for the planned church took an upward turn. Proceeds from the sale of St Mary the Virgin, Westminster were allocated to the building of St Augustine’s. Gifts of church furniture were given to be used in the new church. Building work began on the site and the second St Augustine’s Church took shape. During this time the Empire Exhibition was drawing in vast crowds and a chapel was erected on the Exhibition site. Dedicated to St George, it was the responsibility of the Clergy to be present for regular services and for private prayer. This duty fell to the priest, Father Day. Following on from the laying of the foundation stone by the Duke of Devonshire in February 1925, the new church was completed and was then consecrated by the Bishop of Willesden, Bishop Perrin on October 9th 1926. The Rev. George Day was appointed the first vicar and life in the parish continued smoothly until the outbreak of war in 1939. During the early years of the war there was a lot of local bomb damage. One bomb in particular fell alongside the church in Wembley Hill Road. It flattened the three bungalows and did damage to the foundations of the church. A lovely welcome to the new vicar Father Peerless, who succeeded Father Day who resigned due to ill health. Father Peerless resigned in that year and was followed by Father Elcock. During plans for beautification of the Chancel, it became evident that there was some serious damage to the church building. Attempts were made to rectify the damage but it was not sufficient to make the church safe. The church was closed and a decision was taken to demolish it, on November 3rd 1950. It was voiced at the time that the cause of the fault in the foundations was due not only to the bomb damage, but to the fact that the land site had the history of a ‘pond’ or regular fill of water. Services during the demolition era were held in the old church (1914). 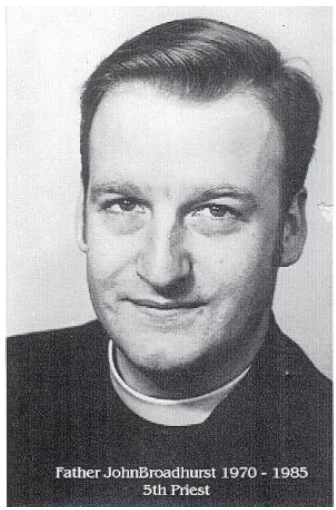 In 1953 the Bishop of Willesden, the Rt. Rev. Gerald Ellison, performed the laying of the foundation stone for our present church – the third on the site. The original 1914 church, which was still in use as a church hall, sadly caught fire and was destroyed. 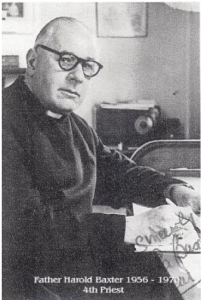 Father Broadhurst, vicar at that time, appealed for funds to replace the hall. A new spire was added to the church and a bell from St John’s, Causton Street, SW1 was hung there. By the late 1990’s it was decided that the “new” hall had come to the end of a useful and busy life. Plans were made for a new building, a hall that would be joined to the church and make access for social events much easier, especially in bad weather. A grand building plan was underway. Scaffolding, mud and lorries everywhere welcomed the new millenium. The building took shape and on June 11th 2000, a hot and happy day, the Bishop of Willesden, Graham Dow, came to bless our new project and put in place a plaque to mark the event. The digital age arrived at the church through the efforts of Father Trevor Crichlow and the then PCC members. A data projector was introduced to support the Sunday services, a sound system was installed and the Parish office had its first computer. The Church bell had to be silenced as a severe crack in the bell was discovered. A fundraising drive was launched. In 2010 Parishioners and friends of the church were able to raise the funds to purchase a new bell from the Whitechapel Bell Foundry who installed the bell in 2011. Parishioners said goodbye to Father Trevor and welcomed The Reverend Helen Askwith as the new vicar.